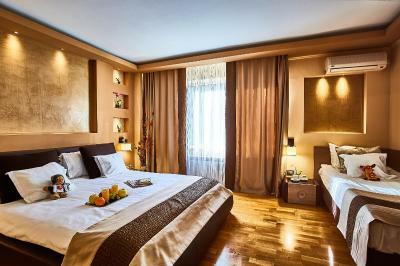 Lock in a great price for Rina Sinaia Hotel – rated 8.4 by recent guests! The room was really great! And at the restaurant we had a great dinner they gave us one free botle of wine. It’s comfortable. It’s quiet. You can relax at the pool or just enjoy the sauna. The food tastes great and the personnel is top notch! First off all the Reception team and I will like to mention Mr. Alexandru, very professional, perfect attitude, smile factor and body language. Thank you! The stuff were really nice and helpful. the breakfast was good , and the location of the hotel is good, close to everything. 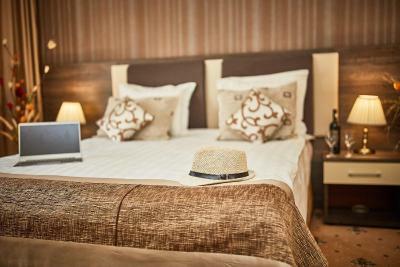 Ideal location, the room was spotless, very comfortable, great heating system and large and modern bathroom. 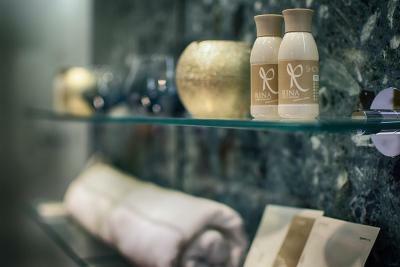 It was a great choice, I would definitely stay at Rina again. 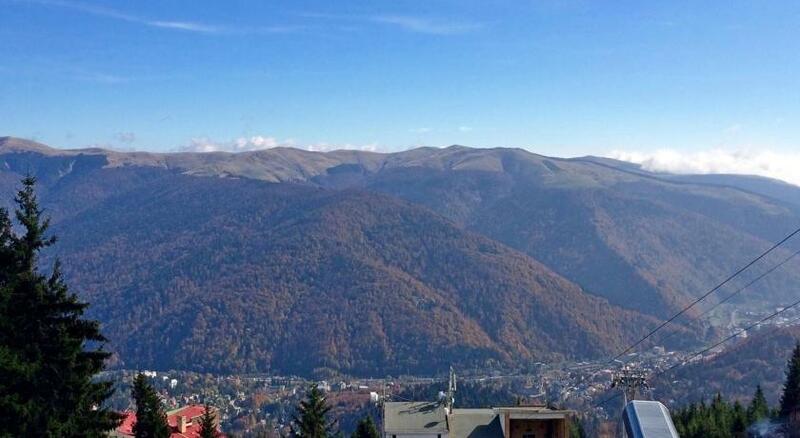 Great location for visiting Sinaia, but not for going to ski. Great and clean room. Pretty good breakfast included and a bottle of red wine as a welcoming gift. Pool access included in the room price. 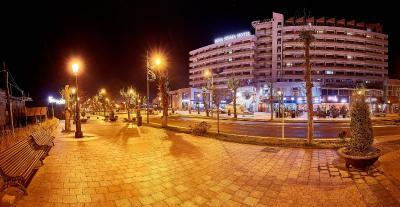 It is near center and park, has children play zone, has good swimming pool and jacuzzy, excelent breakfast. 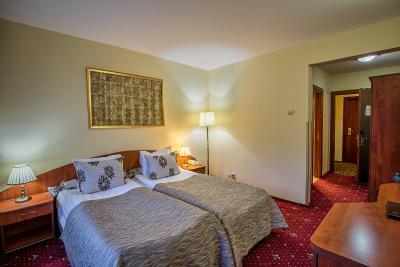 Rina Sinaia Hotel This rating is a reflection of how the property compares to the industry standard when it comes to price, facilities and services available. It's based on a self-evaluation by the property. Use this rating to help choose your stay! 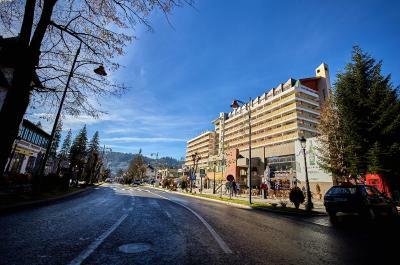 One of our top picks in Sinaia.The centrally-located Rina Sinaia Hotel is right next to the Dimitrie Ghica Park, on the main shopping street. 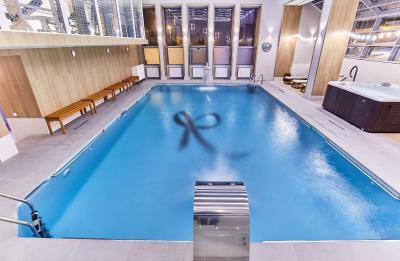 The emblematic hotel offers spa services and features free access to an indoor pool, a sauna and fitness facilities. 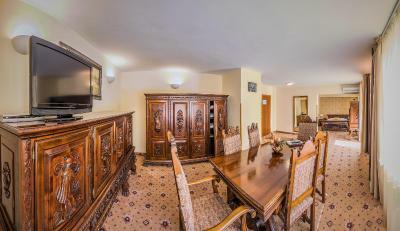 All rooms at Hotel Rina Sinaia feature large windows with panoramic views of the surrounding mountains. 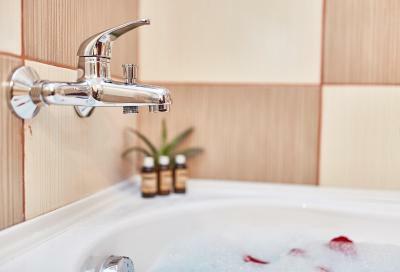 A flat-screen TV and a private bathroom with a bath or shower are provided. WiFi is available throughout the hotel and it's free of charge. An indoor playground is offered as well. For your relaxation, massages can be arranged on request. 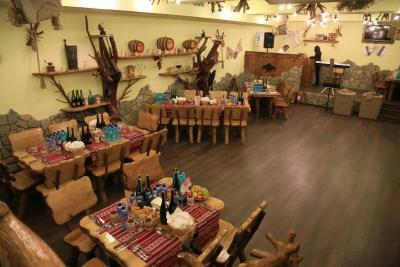 The hotel has a café and a restaurant that serves buffet breakfast and international cuisine. 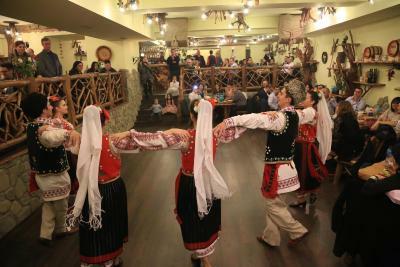 Crama Sinaia wine cellar greets guests with traditional Romanian dishes, live music and dancing on Thursday, Friday and Saturday. Peleş Castle can be found 1.2 mi from the property. 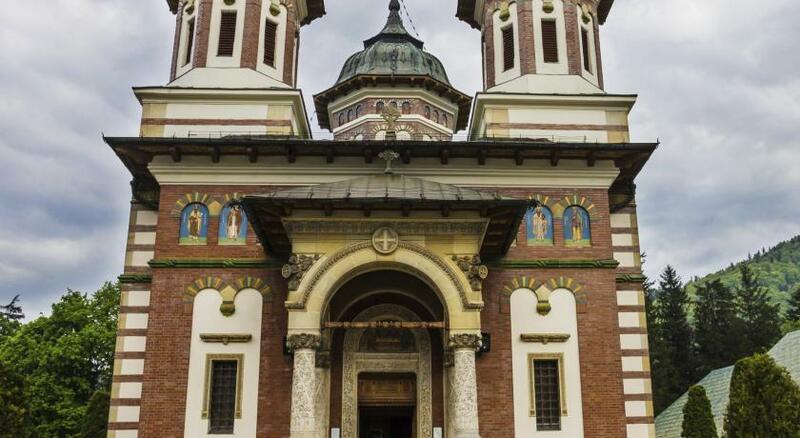 The Sinaia City Hall, Train Station are 1,000 feet away, and the Sinaia Monastery is 1,800 feet from the hotel. 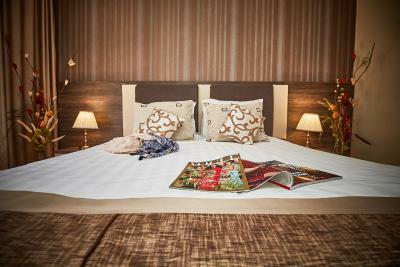 This is our guests' favorite part of Sinaia, according to independent reviews. 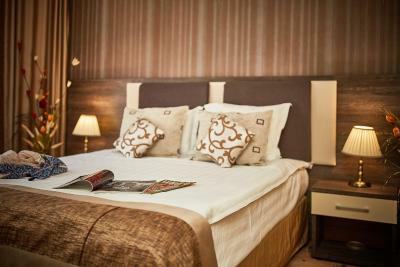 When would you like to stay at Rina Sinaia Hotel? This room offers a flat-screen TV and a mini-bar. Some units feature views of the mountains, while others come with a balcony and street views. Public parking is available on site (reservation is not needed) and costs RON 15 per day. 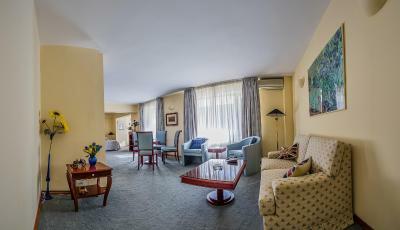 2 interconnected rooms, each with a separate bathroom, offering a flat-screen TV and a mini-bar. Some units feature views of the mountains, while others come with a balcony and street views. 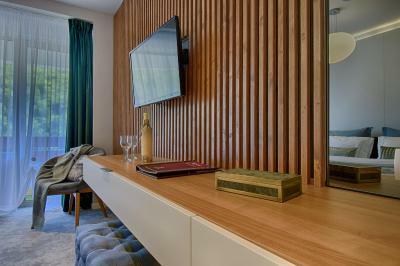 This room offers a flat-screen TV and a mini-bar. All rooms have views of the mountains. 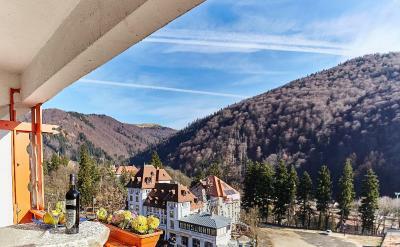 Situated in the vicinity of the family-friendly park “Dimitrie Ghica”, we offer our guests a place of rest and relaxation in any season, in the beautiful mountain landscape of Sinaia. 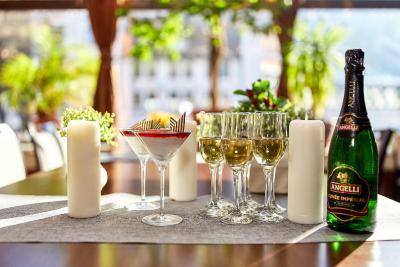 House Rules Rina Sinaia Hotel takes special requests – add in the next step! All children under 6 years are charged RON 50 per night for extra beds. Any additional older children or adults are charged RON 80 per night for extra beds. 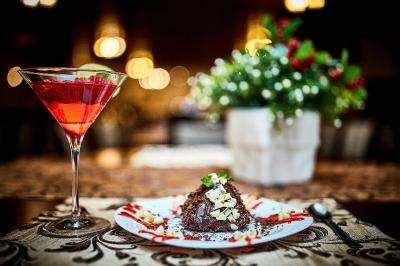 Rina Sinaia Hotel accepts these cards and reserves the right to temporarily hold an amount prior to arrival. Please note that the pool is closed every Monday until 13:00, for maintenance purposes. 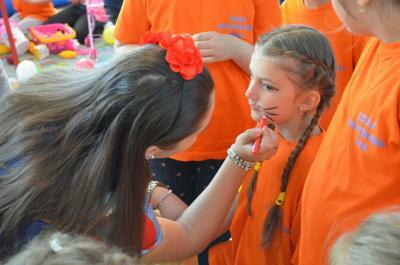 Please note that children under 4 years need to be supervised by a parent at the indoor playground. 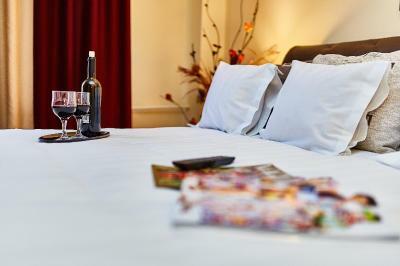 Please note that when booking more than 3 rooms, different policies and supplements may apply. The property will contact you after booking to provide more details. Great location, lovely modern rooms. Comfortable and clean. Nice view, good breakfast. Parking nearby. You need to pay parking...but this could have been included in the price for the room rate. 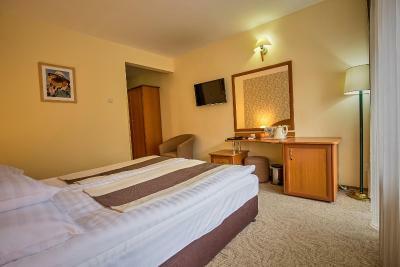 The renovated rooms are really nice, clean and spacious. The bathroom is quite big. Pool access is nice. Breakfast is very good. All you can eat and plenty of choices. The corridors and lobby were a bit shabby but when they are done up to the standard of the rooms they will be beautiful. 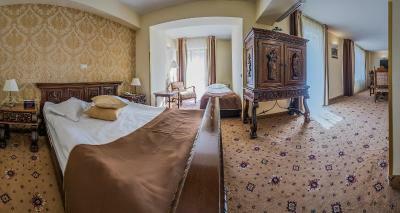 We stayed as a group of 6 friends and had 3 double rooms, all with balconies overlooking the Main Street in Sinaia. The lobby and corridors of the hotel obviously haven’t been updated in years but the rooms and spa must have recently had an overhaul as they were beautiful. We stepped into our rooms and immediately felt as if we were in a boutique hotel :) the spa was small (and busy when we went) but had a decent sized pool, a hot tub along with sauna and steam room. We were given robes, towels and slippers to use for the spa. Breakfast was absolutely beautiful, such a wide selection of food and drink. The hotel also gave us a voucher for a free bottle of wine per room; which we claimed in the hotel restaurant. Really lovely wine for free! The fact that there is no iron in the room. The bathroom door was extremely difficult to close. The breakfast was really good. The bed is super comfortable. Unfriendly Staff. Just to get the room I've had to wait almost and hour (from 3pm to 4 pm so after the checkout period) The pool was very crowded, extra small , there was no place to sit. The room was ok-ish nothing fancy. The breakfast was once again pretty terrible and the restaurant was also very crowded.Food was almost finished and the staff was overwhelmed. As a conclusion is not worth it. The outlook of the hotel is old fashioned but the interior is ok. I can admire the scenery through the window. The staff here have patient to explain to me about the local district tax in Sinaia. 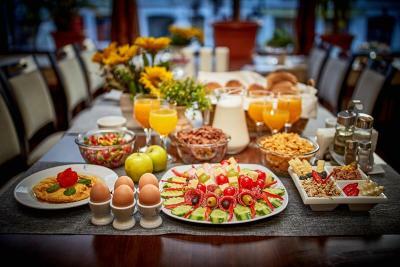 The breakfast was one of the nicest surprise for the quality but also the large number of options available. Both me and my wife were thrilled. We had booked a room with balcony, but we did not have one. The pool is really small, it's suitable for children, but not for adults, with three arm moves you can cross the entire pool. For the massage you need to make a reservation days in advance. The reception staff is overwhelmed at the times when check in starts or at the check out times, so the employees tend to be more stressed and therefore not very nice to the guests. Overall the hotel and what it offers isn't worth 413 RON which is how much we paid for one night. Even the cheaper rooms ( which were all booked when we made the reservation) which cost 280 RON are not really worth the money. The hotel is really clean and the room in which we stayed in at the second floor, was recently renovated with new furniture in the room and in the bathroom. ( not all are renovated ) The breakfast was very good and there were plenty of options to choose from. The SPA is a children's pool with a sauna. Very small and crowded. The capacity of 20 persons as written in the terms and conditios you receive while entering the area should reduced at 4-5 persons at a time. The room was cozy and nice. The food was good and the service ok. Plenty options on the continental breakfast. Swimming pool was dirty tiles above water line were yellow with dirt. Was told we had a new refurbished rooms but we did not, very dated. Staff were not welcoming. The rooms are a bit too small for my taste, but this is not really a problem. The furniture inside the rooms looks great. The beds are comfortable. 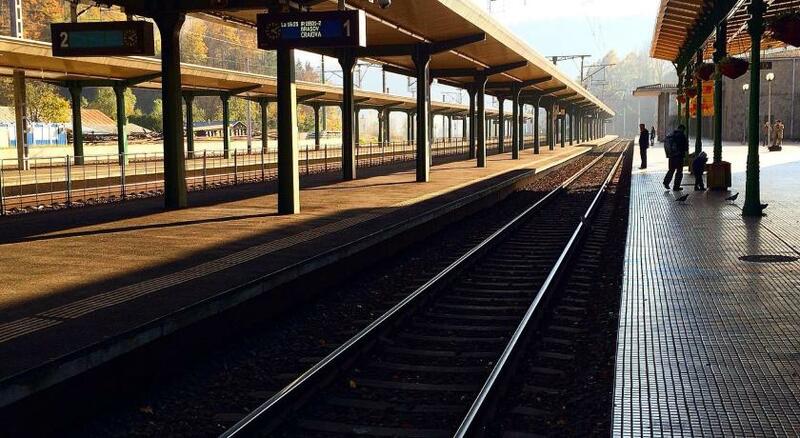 The place is very clean and quiet. Breakfast was OK.